Save the date because is going to be special... We are very happy to be celebrating our 5th anniversary! To play some inspired tunes this time we invited Dom Martin. On the night, as usual, there will be Cake, Champagne and Amazing Surprises! Dom Martin is a Belfast born singer/songwriter who's been mastering his craft in private for over 20 years. He has recently burst onto the UK and Irish music scene and his guitar style and strong vocals are delighting festival and venue audiences wherever he plays. His main influences are Rory Gallagher, Tom Waits, Jimi Hendrix, Bob Dylan, Howlin' Wolf and Muddy Waters. 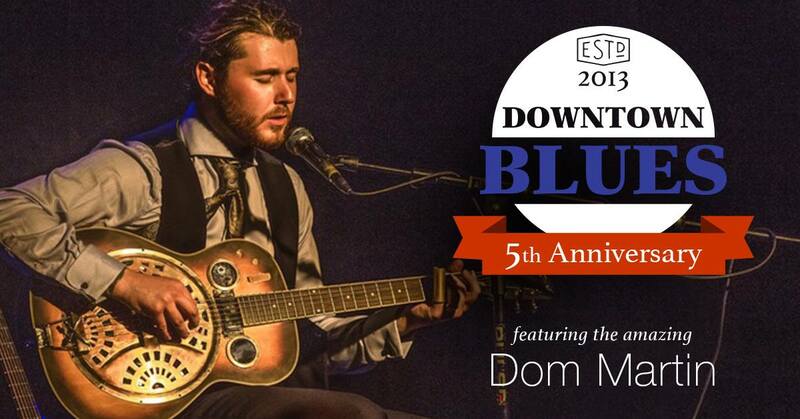 In 2018 Dom has played the Belfast City Blues Festival, headlined the Enler Delta Blues Club Festival, The International Rory Gallagher Festival and has made his mainland UK debut at the Roots to Routes Festival near Watford. He also opens an invitational event (run by Alan Bates) in Fleet Hampshire on 23rd September, which includes Elles Bailey.